I digress for Rugby. Again. The Rugby World Cup continues to eat into my spare time. (For those of you who missed it, I blogged here about my trip to Cardiff to watch Ireland trounce Canada a couple of weeks ago.) Ireland were truly blessed with a comparatively easy pool – we were almost certain to emerge in the top two at the end of the qualifying rounds, thereby earning a place in the quarter finals, but the biggest threat in our group was France. And where do I live? Yup, France! However, I live in a part of France where rugby is not big news – they generally prefer Le Foot around here. Despite this, we’ve found one or two rugby loving friends – the LSH especially – while many of our other friends tolerate our passion with a sort of bewildered affection. The final game in Ireland’s pool was against France. It would decide who won the group and, with that victory, the slightly less difficult route toward the semi-finals – meeting Argentina in the quarter-finals as opposed to meeting the All Blacks. Yesterday was The Big Day. We went all out for team and country. We dropped down to our local coffee shop first thing, resplendent in our green jerseys, to tease the proprietor and to give him an Irish flag. 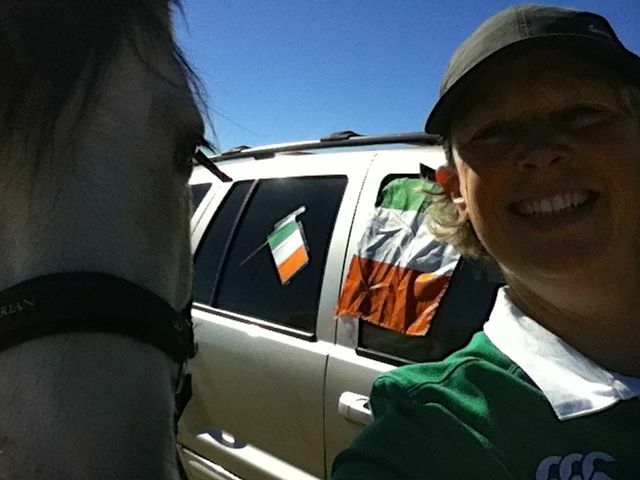 Later on, I was meeting MC to go for a ride and I wore my Ireland jersey (although it was bloody hot by then), stuck cardboard flags onto the sides of my jeep and hung another flag out the window. MC is one of the friends who falls into the ‘bewildered affection’ category. She cracked up when she saw what I’d done. Well, that was more or less the intention. I then threatened to drive her through the market. Non, non, she said she would hide in the footwell if I did. I relented, we went for our ride and then I whizzed home to shower and change. We had no idea what to expect. Would it be outdoors? It’s a bit cold in the evenings for anything outdoors now, so maybe not. Eric then said it was in a sort of private club. And we could play petanque beforehand if we liked. Not knowing what to expect, we donned our green jerseys and set off. 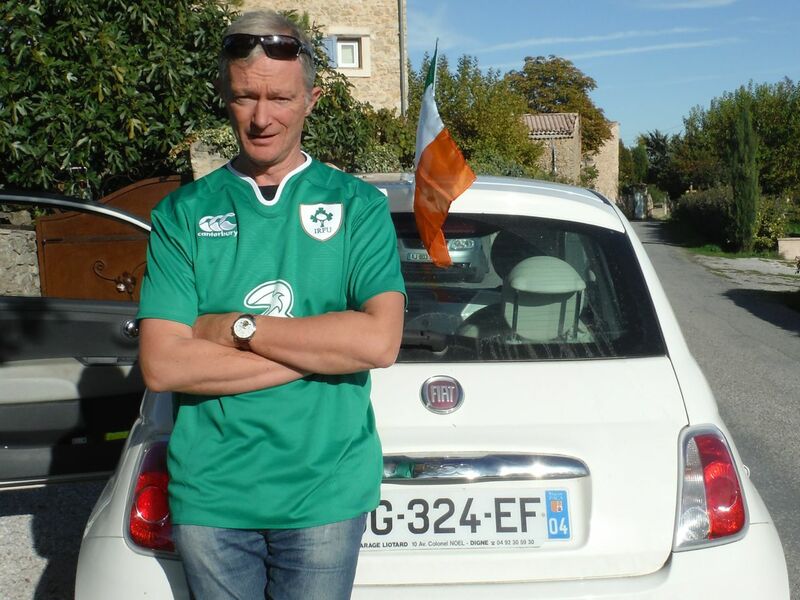 I wanted decorate the Fiat 500, but I couldn’t find the shamrock chains I had made for St Patrick’s day. We brought some little cardboard flags and two ‘proper’ flags instead. The private club turned out to be Eric’s cave, which he has turned into a village open house. Brilliant idea – the village is tiny, with no facilities at all, and Le Cercle de St Pierre give them a place to hang out, have a few beers and chat. They had dug out a few flags too. And a trumpet. 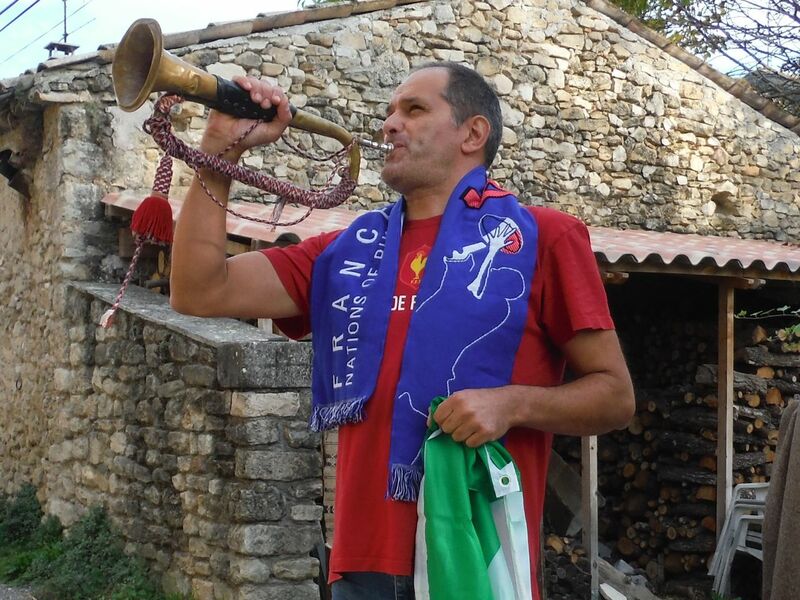 And Eric had a commemorative t-shirt from the All-Blacks/France game in Marseilles in 2009. Very cool. We went and played petanque for about half an hour. I had never played it before and I was quite worried that I might brain someone with one of those heavy metal balls. Yes, my throwing skills are THAT bad. Thankfully, I didn’t kill any of our hosts and, miraculously, my team (Eric and I) won. 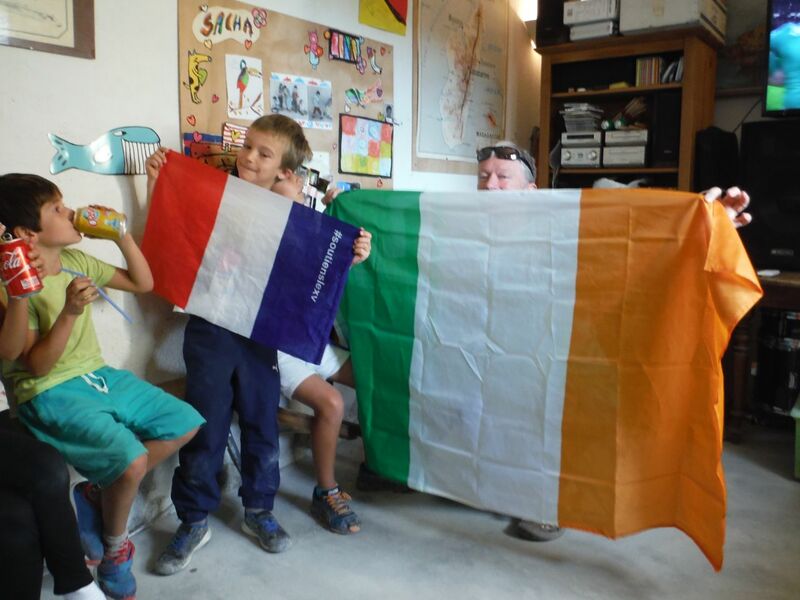 The first victory of the day went to a combined Irish-French team – it was only fitting, really. One of the things I love about rugby is that all the fans get on so well. Good moves on both sides were met with appreciative gasps and claps. Everyone in the room greeted the early departure of two of the top Irish players with genuine regret. Sexton and O’Connell going off injured should have been a devastating blow to the Irish team, but it wasn’t. Instead, the Irish seemed to become stronger and stronger. As each Irish substitute player was brought on, the French hoped for a lessening in ferocity, but they were disappointed; the opposite seemed to happen. The Irish players were, to a man, immense in every sense of the word. At the end of the game, Ireland were clear winners with a score of 24 against France’s 9. Our hosts were gracious in defeat, but I’m sorry to say we weren’t gracious in victory. 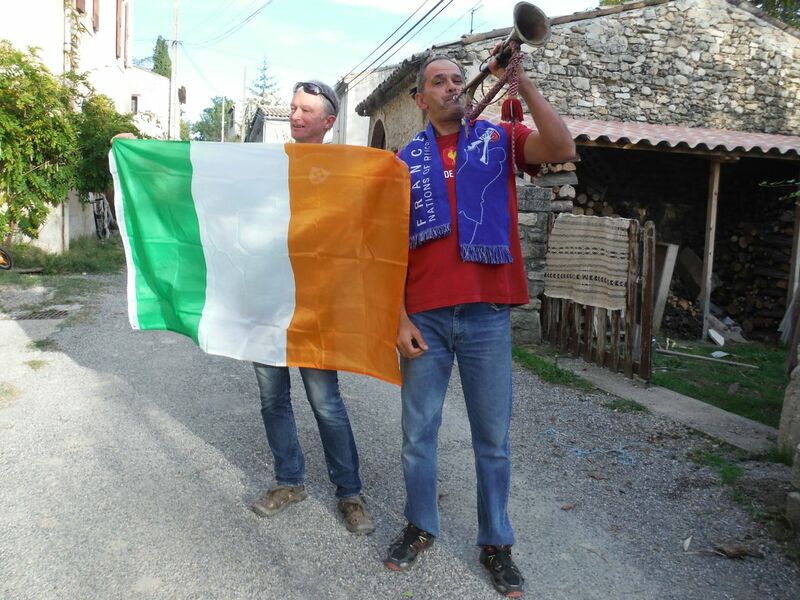 We set off for home waving the flag out the window of the Fiat 500 and tooting the horn as we drove down the narrow street. 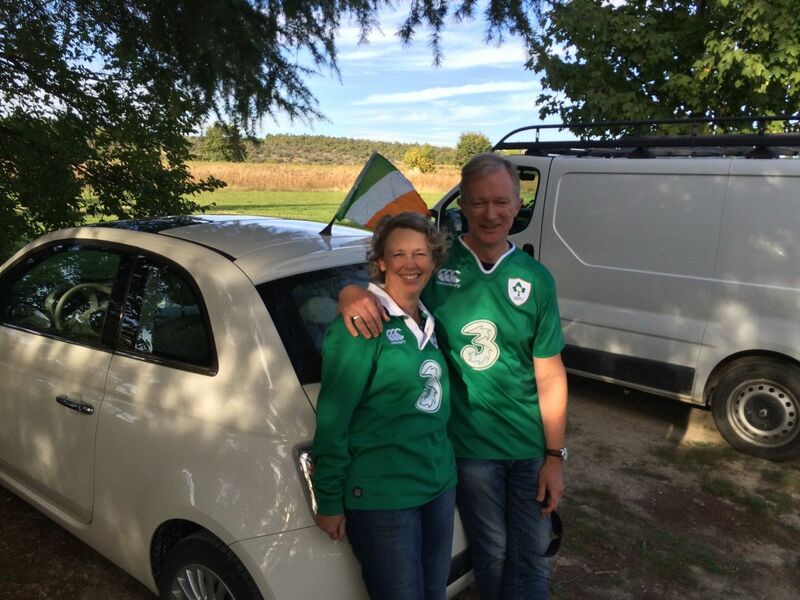 It’s possible that Ireland and France could meet again in the finals. Wouldn’t that be fun. I really must find those shamrock chains. Wasn’t it an amazing match? I was on the edge of my seat watching it!